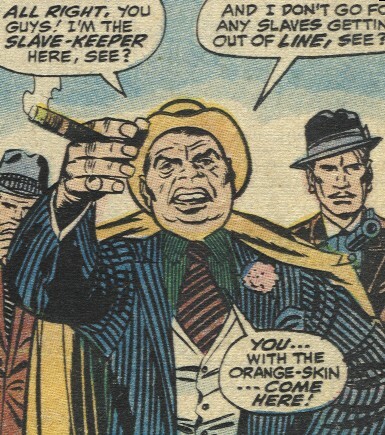 History: Boss Barker is one of the Skrulls of Kral IV, who mimic the appearance and behavior of prohibition era gangsters of Earth. He led a gang on Kral and purchased slaves to compete in a gladiatorial arena. He used his slaves to fight the slaves of rival gang lords to settle territorial and any other kind of dispute. His chief rival was Lippy Louie. 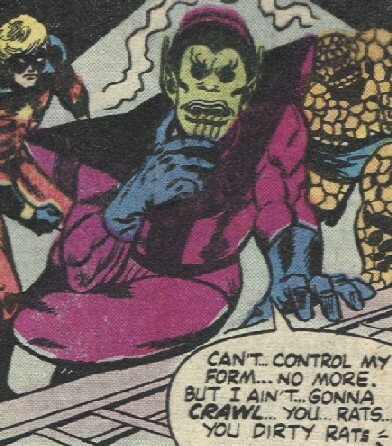 (Fantastic Four I#91) - Barker paid ten perfect power stones for the Thing, who had been captured from Earth by a slaver. Actually, he only put one stone as a down payment, promising the rest when his slave was trained in the arena. He and Lippy Louie argued over whether the Thing could defeat Louie's champion, Torgo. Later, Barker's trainer, Napolean G. Robberson, tested the Thing against another gladiator, Taxtor, who showed the Thing that Barker and his men didn't kid around. (Fantastic Four I#92) - After Robberson finished training and testing the Thing, Barker and his men escaped a bomb planted by Lippy Louie's men. Barker then confronted Louie, who denied the allegations. They both then headed to the Palace, in preparation for the games to begin. (Fantastic Four I#93) - Barker and Louie watched the battle between Torgo and the Thing, each crying foul as the other's slave took the advantage. Barker and Louie continued to argue throughout the bout, increasing the amount of their bet in the process. However, when the Fantastic Four arrived to rescue the Thing, they destroyed the Sonic Disruptor which threatened the slaves' home planets. Torgo then led a rebellion of the slaves, slaughtering their former keepers. (Marvel Two-In-One#45 (fb)) - Barker took the form of a corpse during the struggle, fooling the slaves, who thus left him behind. (Marvel Two-In-One#45 (fb) - BTS) - Barker got his revenge on Torgo, decapitating him and taking his head as a trophy. 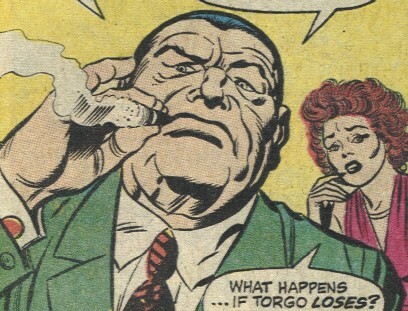 (Marvel Two-In-One#45) - Barker flew his ship to Earth, he then used a vehicle in the form of a prohibition automobile to do a drive by on the Thing. When the Thing pursued and caught hold of the car's bumper, Barker flew the craft into the air and then teleported away, leaving the Thing to fall into the harbor. The Thing was rescued by the Kree Captain Mar-Vell. Barker later ambushed Mar-Vell, blasting him and leaving him for dead. Barker then confronted, blasted, and captured the Thing, taking him back to his base. Mar-Vell, however, recovered and tracked down Barker, occupying he and his androids while the Thing broke free from his restraints. Barker summoned his ship, knowing that it's power could slay the two heroes, but the head of Torgo reactivated long enough to fire an energy blast that dropped Barker, who returned to Skrull form before collapsing. The Thing responded, "He lived a bum, and he died a bum! C'mon, Let's go." The title of MTIO#45 was "The Andromeda Rub-Out!" I always liked that, for some reason. or any other "Boss" or "Barker" characters, including Boss Hogg of "The Dukes of Hazard" and Bob Barker of "The Price is Right." Also known as the Slave-Keeper, Robberson was the trainer for the slaves used in the gladiatorial combat. He taunted the Thing when his Hypno-Glow prevented the hero from trying to attack him. He tested the Thing against Taxtor, a Magno-Man, and a Rhinogron. When the Thing began to resist the effects of the Hypno-Glow, Barker's agent used a Brain-Blast Gun to subdue him. Barker then activated his crushing Hydraulo-Press and was most impressed when the Thing not only resisted it, but destroyed it. He prepared the various slaves, including Torgo, the Thing, the Primitoid, and the Cat-Man for combat in the Palace. He was presumably slain in the slave revolt.